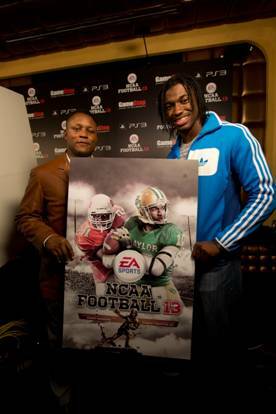 The duo will grace the cover of EA's 2013 edition of their classic college football title. The party was also attended by a bevy of collegiate greats including Trent Richards and Ryan Tannehill. Pretty much everybody at the event was a player expected to go in the first few rounds of the draft... except Sanders of course. He's retired. Probably. NCAA Football '13 features 123 schools and a load of authenticities for fans of the game. It rushes retail shelves on July 10th for the Xbox 360, Playstation 3.